Nepal is most famous for the huge Himalayan Mountains and trekking adventures. 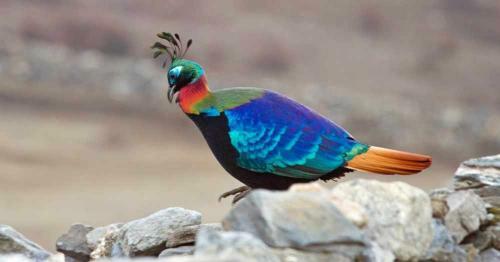 Few people know that Nepal has recorded 886 different species of birds, which is nearly 10% of the world’s total population. 550 birds are residents, 62 are summer migrants, 150 are wintering birds and 74 are rarities. On this tour we expect to see about 200 different species of birds. Winter is a great time to visit Nepal for birding because it is the off-season for trekking due to snow at higher elevations, but at lower elevations the land is snow free and the birding is excellent; there are more birds and less people in the winter months. On this tour the walking will be easy and there will be visits to temples and opportunities to meet the locals. And of course, the views of the Himalayan Mountains will be stunning. Rates include: Domestic transfers, lodging, breakfast, lunch, dinner, scheduled group tours, entrance fees & Allianz travel health insurance. Kathmandu is the capitol of Nepal and it is rich in culture and history. The city has a population of 1.5 million, with nearly 5 million living in the “metro” area. The elevation is at 4,600 feet. February is a dry month and we will not expect to see rain or snow; average temperatures range from 40 – 70 degrees (low-high). We will visit several temples, the Durbur Square Palace and other sites of significance on the first day and do some urban birding as well. From Kathmandu it is a 1.5-hour drive to the Phulchowki and Godawari birding areas; elevation range from 4,600 – 9,200 feet. Phulchowki Mountain is comprised of limestone and low-grade metamorphic marble. The landscape is covered in broad-leaf Oak, rhododendrons, bamboo and shrubs. This area is listed as an IBA (Important Bird and Bio-diversity area). From atop Phulchowki there are great views of the Himalayas. Birds of the day: Kalij Pheasant, Hill Partridge, Black Eagle, Mountain Hawk-Eagle, Himalayan Vulture, Wedge-tailed Green Pigeon, Large-hawk Cuckoo, Asian Barred Owlet, White-throated Fantail, Green Treepie, Black-headed Jay, Mountain Bulbul, White-tailed Nuthatch, just to name a few. After breakfast we will be leaving Kathmandu and taking a short 30-minute flight to the city of Pokhara (elevation 5,700 feet). In the afternoon we will visit several birding sites where we can find birds such as: Ibisbill, White-rumped Vulture, Himalayan Vulture, Red-headed Vulture and the Steppe Eagle. The Pokhara Valley is beautiful and outside the city are small villages and farmland. This day will be both a birding and culture day. We will spend the day birding and visiting a remote village called Ghachowk and Phewa Lake. Ghachowk is located within the Annapurna Conservation Area. A few of the birds we expect to see are: Cinerous Vulture, Egyptian Vulture, White-fronted Goose, Common Cranes, Grey Heron, Purple Swamphen, Intermediate Egret, Yellow-breasted Bunting, Spiny Babbler, Wholly-necked Stork. From Pokhara it is a 5-hour drive to Lumbini, which is the birthplace of Buddha-Lumbini at an elevation of 500 feet. To get there we will travel through some very mountainous terrain, with stops for birding and short walks. Lumbini is a Buddhist Pilgrimage site and a world heritage site as well. In this area Sarus Cranes are often seen. The Lumbini area is huge area encompassing 1.2 million acres (over 2,000 square miles). This is a great area for birding, walking, pagodas and visiting temples. There is a crane sanctuary and birds of the day are: Sarus Cranes, Black-necked Stork, Wholly-necked Stork, Lesser Adjutant Stork, Black-winged Kite, Indian Spotted Eagle, Grey Indian Hornbill, Black Francolin. In Lumbini we will also have good wildlife sightings such as Nilgai Antelope, wild boar and Golden Jackals. From Lumbini it is a 2-hour drive to Pithauli, which is located near Chitwan National Park. We will spend two days in the area for birding and wonderful walks and seeing the sights. Here there is a chance to see the Rufous-necked Laughingthrush. Chitwan National Park, over 500 different species of birds have been identified in this diverse habitat of forest, grasslands and waterways. This area is home to many mammals such as One-horned Rhino, Terai Grey Langur, Spotted Deer, Sambar Deer, Wild Boar and Bengal Tigers. Chitwan borders the Valmiki Tiger Reserve of India. In the morning we will spend more time in the Chitwan area for birding and wildlife viewing. From Pithauli, it is a short 30-minute flight back to Kathmandu, where we will arrive late in the afternoon with time to get organize for the next day’s departure back home.